This would definitely be the time for the Comish to overrule the call and declare it a perfect game. But he probably won’t do the honorable thing. What if, let’s just say, the runner had been safe and the umpire had called him out to preserve the perfect game? Would we be just as upset? Would anyone have even looked at the replay? No, of course not. This kind of play call happens all the time, the only reason this is being discussed is because of when it happened, not that it happened. 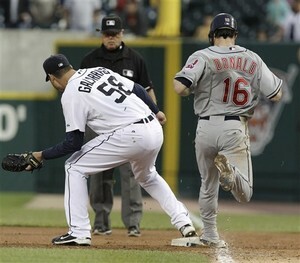 Yes, Armando Galarraga threw a perfect game, yes a bad call means that it will go down as a 1-hitter, but if this was a 15-2 rout would anyone have cared? Jim Joyce made the call he thought was right, not the call he thought would be popular or the call that he thought would get him noticed. He was wrong, he admitted it, it’s one blown perfect game, it is not the end of the baseball universe. It’s unfortunate. I agree that replay should be expanded, but not because of this play in specific. It should be expanded because this is all too common.